After snowboarding, the hunger set in and I had to eat. Since we were in conshy, and H/A wanted to eat korean food, we headed out to August Moon. I’ve never properly eaten here at the restaurant. But I’ve been to two events here. Once was a reception for my brother, and another was a proper wedding reception. Both times I remember the food being quite good. But this was a long time ago. This time around, I was severely underwhelmed. Are the catering cooks different than the restaurant cooks? Or maybe the cooks are just different now. The banchan was quite good though. The sprouts and the cucumber kimchi were particular standouts. The daikon kimchi was a bit too gingery, but still good. 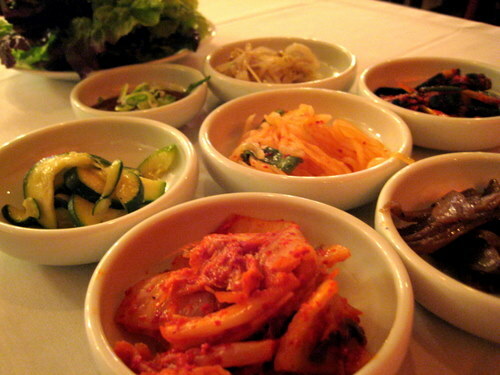 The good banchan made me think that the food would also be quite good. Oops. H/A got the bulgogi. It came precooked because it was only one order. If you order at least 2 portions, then you can cook it on your own at the table. This was ok, nothing special. It actually tastes like the bulgogi that you can buy from H Mart that you cook up at home. It certainly didn’t taste like it came from a restaurant. I wanted to get several things, jjamppong and some of the bibimbaps, amongst others, but since I found them freakishly overpriced, I went with the ojingaboekum. 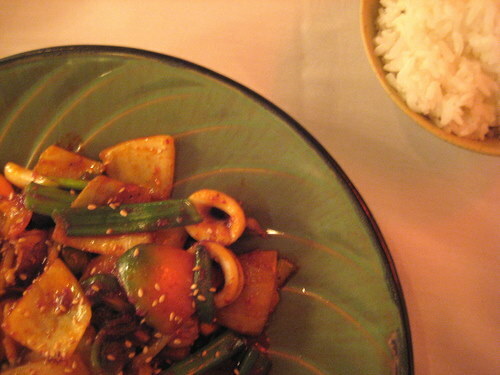 This was, by far, the worst squid stir-fry I’ve ever had at a korean restaurant. It wasn’t because the taste was bad. The sauce was actually quite good. But instead of big slices of thick and fresh squid, it was rings of little squid, like the ones they use in fried calimari, and you could tell that it was frozen. And instead of lots of these squid rings, it was mostly big hunks of onion. Typically, the onion should be thinly sliced instead of these giant crunchy hunks. It was as if I’d ordered onion stir-fry, and they threw in some calimari rings just to add more substance. It was severely disappointing. For a restaurant that charges the prices that it does, I expect fresh and quality ingredients. And I expect a squid stir-fry dish to mainly be made up of the squid. So much potential with the sauce, but they blew it. Service was just fine. The food took a long time to come out, even though the restaurant was absolutely deserted on this friday night. There was a big party going on in the back, so that must have preoccupied all the cooks. Our server was quite nice though, and was always filling our cups with warm boricha. But as far as korean food is concerned, go elsewhere. Pretty much anywhere near 69th street or in the northeast is going to be better. Heck, the food courts of H Mart and Assi are better! I’m a big fan of the banchan and the sushi bimbimbap! Once I discovered that dish, I ignored the rest of the menu. Sorry to hear about your not so good Korean food experience. Is it normal to have jjampong and bulgogi on the same menu in PA? If not, maybe that is the first clue to go elsewhere. :) What is your favorite Korean place in PA? yeah, i was sorry too! around here, it is actually kind of normal to have both on the same menu… while we do have the specialized bbq places as well as the specialized korean/chinese noodle places, most korean restaurants do have a varied menu. favorite place? seo ra bol is always a good and safe bet. i hear that a new fancy center city place is good, but i like to avoid center city… even the closest place in the burbs, nagwon garden, is excellent in my book! how about you? 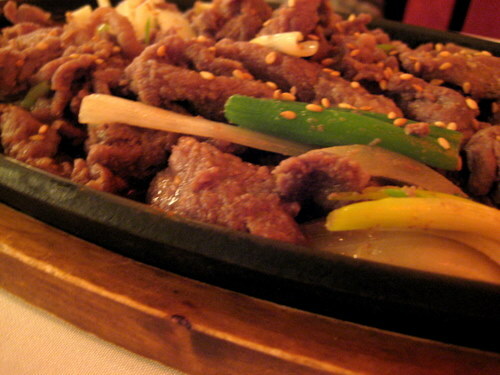 with all the korean spots in nyc, how do you pick?